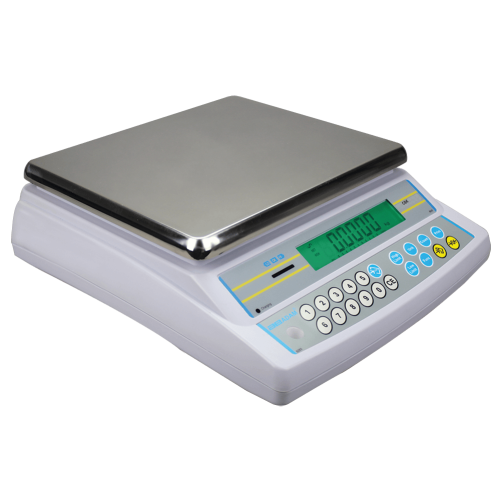 The CBK range of checkweighing bench scales is a highly-versatile weighing machine that can perform multiple tasks in industrial warehouse environments, saving money that might have been spent on purchasing multiple machines. This versatile scale can be used for parts counting in small manufacturing companies, at veterinary office to weigh small animals, or for grading fruit. Checkweighing is simplified with LED limit indicators, while built-in memory stores limits for up to 10 samples. The easy-to-clean stainless steel pan provides a large surface for weighing and counting. Data communication is enabled via the included RS-232 port, making inventory recording easy. CBK bench scales utilise built-in checkweighing functionality to accurately check the weight of screws, bolts and small machinery components required in engineering and manufacturing processes. CBK checkweighing scales can be set up on warehouse workbenches to check the weight of packaged products. The high weighing capacities of these scales ensure that boxes containing multiple individual goods weigh the optimum amount before placing into storage or loading onto lorries for distribution. NMI trade approved CBK bench scales are often used for packing crates of fruit and vegetables that are then sold in units by weight to supermarkets. The checkweighing indicators on the scale alert operators when a box is under, over or of optimum weight.